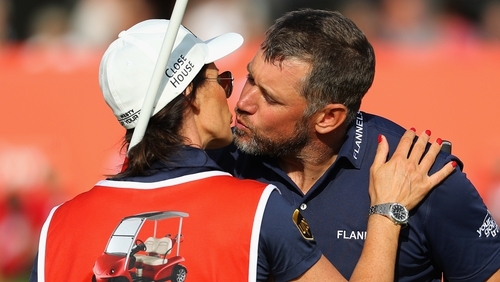 Lee Westwood laughed off his chances of a Ryder Cup wild card after claiming a one-shot lead in the final qualifying event, despite a late stumble in the Made in Denmark. Westwood had surged to the top of the leaderboard in the Silkeborg event with two birdies on the front nine and five more in succession from the 10th, only to find water off the tee on the 18th to run up a double-bogey six. The resulting 67 left the 45-year-old on 16 under par and a shot behind compatriot Jonathan Thomson, only for Thomson to then also take six on the last after a wayward drive. Westwood therefore ended the day a shot in front of Thomson, fellow Englishman Steven Brown and Belgium's Thomas Detry, with England's Matt Wallace another stroke back. Asked about the possibility of winning his 24th European Tour title on Sunday to earn a wild card from European captain Thomas Bjorn, Westwood - who is one of Bjorn's five vice-captains - said: "He doesn't want an old man like me playing, he wants the young kids in. "I've played 10 and I know when my game is really on song ready for the Ryder Cup and I think there's more people valuing a pick than me." Speaking about his round, Westwood added: "I played great all day. I made one bad swing off the 18th tee but it would be stupid to focus on that as well as I played. "I had it under control all day and stood over the ball, the wind just puffed up a little bit and I leant on it instead of just swinging past myself and it squirted out right. "But it was a good round of golf, made five birdies in-a-row on that back nine and it was good fun. I nearly holed it on 10, then hit two great shots at 11, great tee shot on 12, nice tee shot on 13 and then two big hits up the hill on 14 for me to get it nearly flag-high in two." Thorbjorn Olesen occupies the only automatic qualifying place still up for grabs and can make certain of a Ryder Cup debut with a top-six finish, while England's Eddie Pepperell and Matt Fitzpatrick need to win to have a chance of dislodging the Dane. A third round of 66 kept Fitzpatrick in the frame and left him six shots behind Westwood, but Pepperell's slim chance disappeared with a 74 to fall 13 strokes off the pace. Olesen, who made the halfway cut with nothing to spare, is nine shots off the lead after a 67.